No one has ever taken the art of custom weaving to the levels of renowned rod builder Doc Ski. For over 30 years, Doc has been quietly developing, weaving and perfecting designs that simply stagger one's imagination. 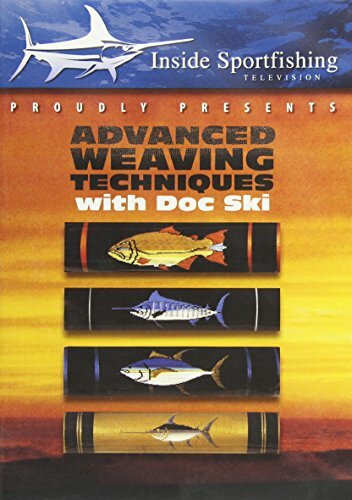 Now, for the first time ever, you can learn the secrets of Doc Ski's incredible custom weaves. This is no ordinary "how-to" program, rather an in-depth look into one of the world's finest rod builders. Every aspect of custom weaving has been covered, from basic single color designs, to the intricacies and minute details of multi-level, multi-colored patterns. Step by step, Doc walks you through all the hard parts, as he explains the mechanics of fine thread art in simple, easy to understand terms. Doc has dedicated his adult life to building rods and this is his gift to anyone who has ever wanted to learn how to weave magic.